A bill is a proposed law. It may be drafted by any competent person. The Legislative Services Commission's Bill Drafting Division and Research Division draft bills at the request of the members of the General Assembly. Only a member of the General Assembly may introduce a bill - that is, present it to the General Assembly for its consideration - and that member is called the bill's introducer or sponsor. At the proper time during each daily session, the presiding officer announces "Introduction of Bills and Resolutions." A member wishing to introduce a bill has already filed the bill with the Principal Clerk on the previous legislative day when it received a bill number. The Reading Clerk reads aloud the name of the introducer, the bill number, and the bill title. At this point the bill has passed its first reading. Normally, when a bill is introduced, the Chair of the Rules and Operations of the Senate Committee for Senate bills and the Speaker of the House of Representatives for House bills name a committee to which the bill will be assigned for careful study and recommendation. If the committee approves the bill, it reports this fact and the bill is placed on the calendar - the daily schedule of business - for consideration by the full membership of the body. Changes to the bill may be recommended by the committee or may be proposed by any member from the floor. When the time comes for a consideration of the bill by the full membership of the house (Senate or House of Representatives), the Chair will recognize the sponsor of the bill or the chair of the committee which recommended the bill for passage. That person will explain the bill, and then any member who wishes to speak for or against the bill will be heard. Sometimes there is lengthy and heated debate; sometimes there is virtually no debate at all. After all who wish to be heard have spoken, a vote is taken. If the vote is favorable, the bill is said to have passed its second reading and moves to its third and final reading, at which time there may be more debate. After a bill has passed its third reading in the house in which it was introduced, it is sent to the other house, where it goes through the same process as in the first house - that is, it is referred to committee, and if approved, is debated and voted on at the second and third readings on the floor. It often happens that the second house will make changes in a bill which was passed by the house in which the bill originated. In such cases the bill must be returned to the house of origin with a request that the first body concur in the changes. If the original house does concur, the bill is ready to be enrolled and signed into law. If the original house objects to the amendments adopted in the other house, the two presiding officers may appoint members to a conference committee which seeks to reconcile the differences between the two houses. If the committee can agree upon the disputed subject, the committee reports to each house, and the two houses vote on the recommended text. If either house rejects the conference committee's recommendation, new members to the conference committee may be appointed to try again. After a bill passes both houses, it is enrolled. A clean copy, including all amendments, is prepared, with space for the signatures of the two presiding officers, and the governor, if necessary. The enrolled copy is taken to each presiding officer during the daily session. Each officer signs the enrolled copy. When the second signature is affixed, the bill is said to have been ratified. If the bill is a local law, it becomes law at that point. In November 1996, the citizens of North Carolina voted to amend the State Constitution to allow for a gubernatorial veto (Section 22 of Article II of the North Carolina Constitution). All Public Bills other than bills making appointments, proposing constitutional amendments, or revising districts are presented to the Governor on the day following ratification for the Governor's approval or veto. If the Governor signs the bill or takes no action on the bill, the bill becomes law. During session, the Governor has ten days after presentation to act. After adjournment of the General Assembly, the Governor has 30 days to act on a bill. The Governor is required to reconvene the General Assembly if a bill is vetoed after adjournment, unless a written request is received and signed by a majority of the Members of both houses that it is not necessary to reconvene. If the Governor vetoes a bill, the bill is returned to the original house where 3/5 of present and voting members can vote to override the veto. If the original house votes to override the veto, the bill is sent to the second house where 3/5 of present and voting members must also vote to override the veto before the bill can become law. After it becomes law, the term "bill" is no longer used.  The enrolled act or law is given a chapter number and is published under that number in a volume called "Session Laws of North Carolina." Adopted by the General Assembly in 1893, the Latin phrase means "to be rather than to seem."